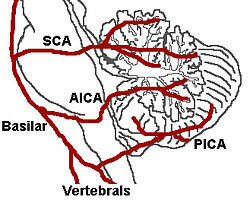 The three major arteries of the cerebellum: the SCA, anterior inferior cerebellar artery (AICA), and PICA. Anteroinferior surface of the cerebellum, the flocculus, middle cerebellar peduncle and inferolateral portion of the pons. The anterior inferior cerebellar artery (AICA) is one of three pairs of arteries that supplies blood to the cerebellum. It arises from the basilar artery on each side at the level of the junction between the medulla oblongata and the pons in the brainstem. It has a variable course, passing backward to be distributed to the anterior part of the undersurface of the cerebellum, anastomosing with both the posterior inferior cerebellar (PICA) branch of the vertebral artery and the superior cerebellar artery. It also gives off the internal auditory or labyrinthine artery in most cases; however, the labyrinthine artery can less commonly emerge as a branch of the basilar artery. The amount of tissue supplied by the AICA is variable, depending upon whether the PICA is more or less dominant, but usually includes the anteroinferior surface of the cerebellum, the flocculus, middle cerebellar peduncle and inferolateral portion of the pons. Occlusion of AICA is considered rare, but generally results in a lateral pontine syndrome, also known as AICA syndrome. The symptoms include sudden onset of vertigo and vomiting, nystagmus, dysarthria, falling to the side of the lesion (due to damage to vestibular nuclei), and a variety of ipsilateral features including hemiataxia, loss of all modalities of sensation of the face (due to damage to the principal sensory trigeminal nucleus), facial paralysis (due to damage to the facial nucleus), and hearing loss and tinnitus (due to damage to the cochlear nuclei). Vertigo may sometimes present as an isolated symptom several weeks or months before acute ischemia and cerebral infarction occurs, probably with the meaning of transient ischemia of the inner ear or the vestibular nerve. There is also loss of pain and temperature sensation from the contralateral limbs and trunk, which can lead to diagnostic confusion with lateral medullary syndrome, which also gives rise to "crossed" neurological signs but does not normally cause cochlear symptoms, severe facial palsy or multimodal facial sensory loss. ^ Jones, Jeremy; Gaillard, Frank. "Anterior inferior cerebellar artery". Radiopaedia.org. Retrieved 31 May 2015. ^ Atkinson WJ (1952). "The effects of occlusion of the anterior inferior cerebellar artery". Ann R Coll Surg Engl. 12 (2): 126–35. PMC 2377605. PMID 13017512. ^ Amarenco, Pierre; Hauw, Jean-Jacques (1990). "Cerebellar Infarction in the Territory of the Anterior and Inferior Cerebellar Artery". Brain. 113: 139–55. doi:10.1093/brain/113.1.139. PMID 2302529. ^ Deschauer M, Georgiadis D, Lindner A (1998). "[Hearing loss as the leading symptom in anterior inferior cerebellar artery infarction]". Fortschr Neurol Psychiatr (in German). 66 (3): 109–12. doi:10.1055/s-2007-995245. PMID 9565760. ^ Oas JG, Baloh RW (1992). "Vertigo and the anterior inferior cerebellar artery syndrome". Neurology. 42 (12): 2274–9. PMID 1461378. ^ Izumi M, Terao S, Sobue G, Koshimura J, Takatsu S, Yokoi Y, Takahashi M, Mitsuma T (1996). "[Clinical features of anterior inferior cerebellar artery territory infarcts--a study of ten patients]". No To Shinkei (in Japanese). 49 (2): 152–6. PMID 9046527. "Anatomy diagram: 13048.000-1". Roche Lexicon - illustrated navigator. Elsevier. Archived from the original on 2014-01-01. The arteries of the base of the brain. Anterior inferior cerebellar artery labeled near bottom. The temporal pole of the cerebrum and a portion of the cerebellar hemisphere have been removed on the right side. Inferior aspect (viewed from below). This page was last edited on 1 April 2019, at 19:09 (UTC).